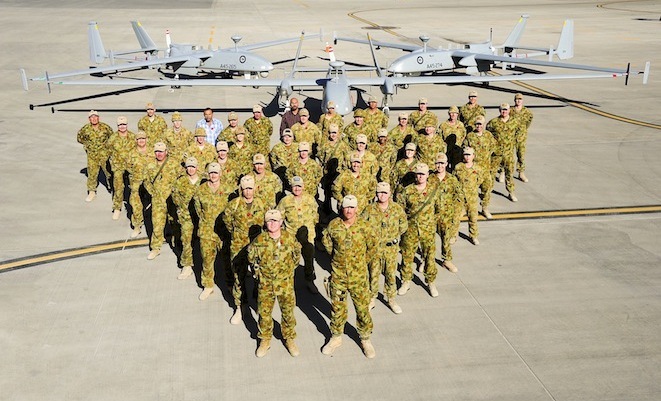 The RAAF’s Heron remotely piloted aircraft (RPA) detachment’s mission to Afghanistan has ended following the final mission being flown on November 30. The detachment was established at Kandahar in August 2009 following a rapid acquisition program called Project Nankeen which resulted in the IAI Heron being selected through an initial partnership with the Canadian forces, and with contractor support from Canadian firm MacDonald Detwiller & Associates (MDA). Crews initially trained in Canada in July 2009 before posting straight into theatre with the system. In the five years of the detachment, 15 rotations comprising 490 ADF personnel from all three services have cycled through Kandahar Airfield to operate the Heron and its ground control segment. In that time, the three aircraft have flown a total of more than 27,000 intelligence, surveillance and reconnaissance mission hours in support of Australian and coalition ground operations. “The Australian Heron capability forged a fine reputation among our American and other Coalition partners here in ISAF as a result of our can-do attitude and the capabilities of this aircraft,” Heron Rotation 15 Commanding Officer, WGCDR Phillip ‘Budgie’ Parsons said in a statement. The Heron mission was extended for two additional six month tours late last year after the withdrawal of Australian ground forces from Afghanistan. More recently, it was announced two Herons will be retained for a further six years until 2020, during which concepts of operation will be developed in preparation of the planned arrival of the Northrop Grumman MQ-4C Triton UAS. “The additional Heron aircraft will provide greater opportunities for training, and the development of robust tactics, techniques and procedures for operating complex UAS platforms, as well as the integration into Australian airspace,” Defence Minister Senator David Johnston said in an October 28 statement. It is expected all Heron detachment personnel and equipment will have returned to Australia by the end of December. Why not call it what it is; a UAV? We call it what the RAAF calls it, and that’s an RPA. An RPA is hand flown from a controller, whereas the term ‘UAV’ or ‘UAS’ suggests a degree of autonomy which the Heron does not have.